Eu me identifiquei com o post na hora, sou uma louca por papéis, cadernos, canetas e tudo mais que tem dentro de qualquer papelaria. E também adoro escrever tudo à mão, como contei nesse post aqui. E foi de uma conversa com a Rosa sobre clube de cartas que surgiu a idéia de entrevistar a Lucy Edmonds, que fundou a Quill London, um shop de papelaria super estilosa que também tem um clube de cartas da qual faço parte e um workshop de caligrafia. Tell us a little bit about Quill and how it all started? Quill was born out of Lucy’s love for beautiful things and meaningful correspondence. After scouring the globe in 2012, she returned to London with an eclectic collection of stylish stationery and paper goods sourced from Japan all the way to San Francisco. Where does the passion for all things paper come from? I think the beauty of paper is in its tangibility and the various textures it can offer. It is functional but it doesn’t have to be boring: you can get anything from heavy weight card with sharp corners to feather-light, softly deckled-edge paper. Combine this with stationery and its enough to elevate any product. Living in such a digital era, paper can bring you back to the physical world of writing with a pen, taking notes and sending a handwritten letter. Our studio desk goes through many stages throughout the week. At times it can be covered in various calligraphy projects, such as envelopes or place cards, whilst we work to last minute deadlines. At others, it will be scattered with laptops and cups of tea as we have our weekly meetings. Perhaps the most constant part of our desk is our brass tray with two pen pots that house all of our favourite essential writing utensils and accessories. I love letters, I found Quill London searching for letters clubs. The London Letters Club, how it came about? As both stationery and calligraphy are at the heart of Quill, I realised there was a way to combine the art of hand-writing with lovely paper goods by creating a community of letter-writing lovers that would help revive the art of correspondence. Since beginning the initiative in 2017, we have paired up over 300 people across the globe. It’s truly amazing to see the friendships that have been formed purely by putting pen to paper. Letters were already part of your life before the London Letters Club? Yes, absolutely. I first began writing letters to my grandmother whilst at boarding school and I loved checking the mailbox to see if I had received her reply. Since then, I’ve always loved sending out snail-mail as I think it’s so lovely to receive something handwritten instead of by email or SMS. What you think is the meaning of things handwritten, such as letters or calligraphy invitations, nowadays? Words are powerful and become even more meaningful in this fast-paced age, especially when someone has taken the time to handwrite them. Even just a short handwritten note can change someone’s mood, because its clear you’ve taken the time to dedicate something to them and it really shows you care. How you got started in modern calligraphy? A few years after Lucy launched Quill, she spotted all of the beautiful modern calligraphy coming out of the USA and realised there was nowhere in London you could learn it. She put on London’s first modern calligraphy workshop and hasn’t looked back! Definitely! Calligraphy can be a hobby that you dip in and out of as and when life and time allows. It’s very meditative and practising even a few times a week will encourage you to step away from a screen and help you see improvements in your letter forms! What is the best seller item of Quill? Oh, it’s so hard to say! At the moment it seems everyone is loving wax stamps. We’ve got a range of botanical designs and a few new ones with calligraphy motifs, which have been rapidly depleting from the shelves. Notebooks and pencil cases have been popular recently, too! How is it like to keep a business like a stationary in a world so digital? Living in such a digital age means that everything is incredibly fast-paced, and so I think there’s a part of everybody that wants to slow down and return to analogue ways. That’s not to say that technology isn’t beneficial - the digital world is what enables us to connect with our customers. London Letters Club is a perfect example of how you can marry the connectivity of the digital world with physical communication and tangible paper goods. Stationery truly has the ability to speak to everyone in its own way, whether it be through a nice pen, a lovely notebook or a writing paper set. You can’t deny the rapid onset of our digital age and the benefits it bestows, but also we know that stationery has the ability to speak to everyone in its own way. At work, you rely on digital or paper to do list? All of the girls at Quill always have a notebook on hand for their to-do lists! There’s nothing we find more satisfying than finishing a notebook and choosing our next one! Describe a day in Quill London Studio? There are no two days that are the same in the Quill London studio! We’re a small team but wear many hats so there’s always something going on: from our busy workshop schedule, packing up orders and taking wedding meetings, to sourcing new stationery products and finishing off calligraphy jobs. Is there anything bad or difficult about working with stationery and calligraphy? In my thoughts it must be a dream! We all absolutely love working with stationery and calligraphy. There can be some trying times when you’re trying to find the right ink that doesn’t bleed to match your paper stock but overall working with paper goods is an absolute delight. 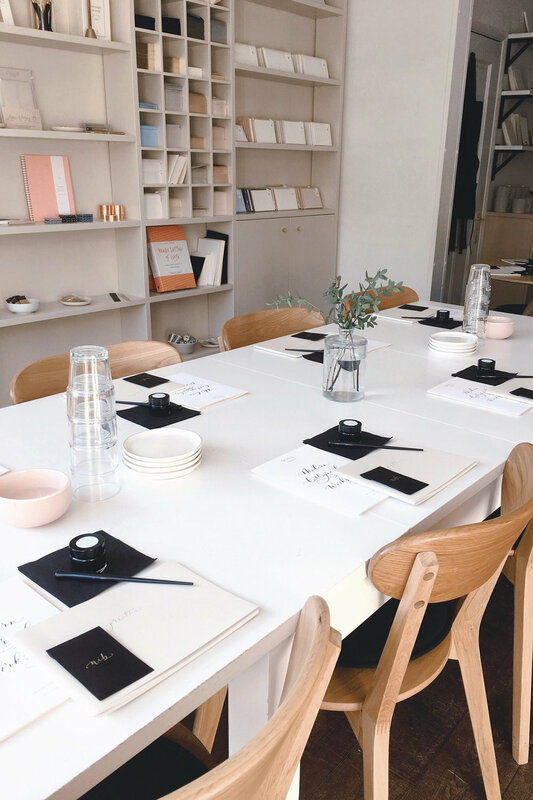 There’s also such a sense of community surrounding stationery and calligraphy and we love that we get to meet so many people through our shop, studio and classes. Any plans for the future, paper related? We’d love to create our own in-house stationery range and we’ve already been working on a few secret projects, so watch this space! Porque Precisamos Falar Sobre Burnout.